How are you? I hope you are safe and warm wherever you are, brrrr it´s getting cold in Germany. How wonderful to sit in a comfy little cafe and write an article for you. Lately I´ve heard a lot of people complain about monkey mind so I thought it´s a good topic for today. What exactly is the meaning of monkey mind? Good old Wikipedia comes up with this: Mind monkey or monkey mind, from Chinese xinyuan and Sino Japanese shin'en 心猿 [lit. “heart-/mind-monkey”], is a Buddhist term meaning "unsettled; restless; capricious; whimsical; fanciful; inconstant; confused; indecisive; uncontrollable". Thoughts jump from one thought to the next in spirals and in circles. There is no way to stop them, they seem to have a life of their own. When life is calm, they are manageable but beware when life gets difficult and chaotic. They speed up, go into chaos and drive me into confusion, making it impossible to calm the thoughts. They take over every minute of my life, even at times when I should rest and sleep, they jump at me and torture me. Do you think I´m a bit exaggerating? No, no I´m not. Please leave a comment at the end of the post, with your monkey mind experience. Your personal experiences are extremely valuable for me and other readers. 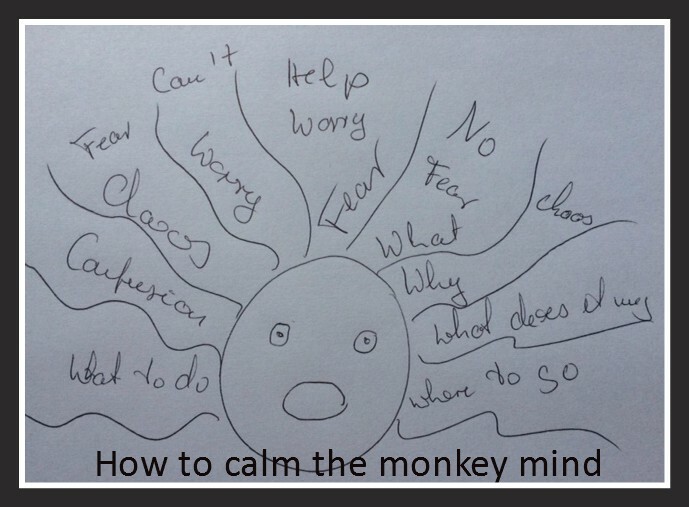 Now let´s come to some solutions on how to calm the monkey mind. Meditation is another effective way to calm the monkey mind. There a several ways to do it. These are my favorite ones: I love to do guided, sitting meditation. For example, Jack Kornfield, Deepak Chopra, Jon Kabat Zinn offer some great simple and free meditations on their sites. (Click the blue links). Just sit on a chair or a cushion and listen. Easy, easy, nothing to think about, nothing to do, just sit and observe what´s going on. It was very hard for me to start with meditation, so I signed up for a 6 week course: meditation for beginners. I had to go there and meditate with others, which was very helpful to gently establish a habit. Deepak Chopra for example offers a wonderful 21 day meditation practice, which I find very beautiful. Creating art, collages, paintings, music, writing are all great methods to calm the mind and bring joy and fulfilment into life. I love to create vision boards and collages, it´s no mess, you do not need expensive supplies, artistic talents or technical knowledge. You just cut out images from magazines, calendars, books, posters, arrange the images on a poster board and enjoy the meditative process of being creative. When you are caught in a melancholic mood, (a nicer word for depressed), it sometimes helps to just sit down and let your creative juices flow. The emphasis is not on getting a nice result, but to get your feelings out of your mind. Julia Cameron´s: The Artist Way is a great book , which can help you to get in touch with your creative side. Also Chris Zydel from Creative Juices Arts, offers great courses, offline and online. Ok dear friend that´s it for today. I wish you a warm, cozy and calm holiday season and hope these few tips will help you keep your sanity before the holidays. Stay calm! As a coach I love to support clients to bring out the best in them, to live fulfilled, selfexpressed, successful, joyful lives. 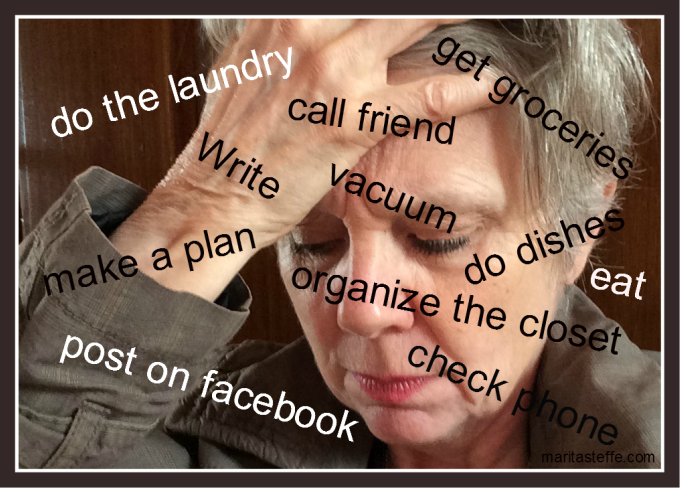 Next Next post: Why is it Liberating to Let Go?